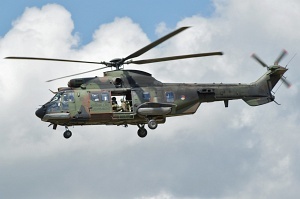 The Aérospatiale AS 332 Super Puma / AS 532 Cougar is a twin-turboshaft-engined medium utility transport helicopter produced by the French manufacturer Aerospatiale, today Eurocopter. The AS 332 Super Puma is primary used by civil operators for offshore passenger and material transportation to oil- & gas rigs. Helicopters in military duty are designated AS 532 Cougar. The AS 332 / AS 532 is a stretched development of the Aérospatiale SA 330 Puma with new engines. The variants are produced with a fuselage length of 15,53m (50ft 11in), 16,29m (53ft 5in) or 16,49m (54ft 1in) and different main rotor diameter of 15,60m (51ft 2in) or 16,20m (53ft 2in).